It is of an utmost importance to differentiate between custom made wigs and Hair System made in Hollywood, CA which is patented in the USA and is represented in Europe by Fi Potencial d.o.o. company. There are several companies claiming that they offer the original Hair Systems but we are happy to be able to meet the demands of the show business and entertainment in Hollywood – and I guess you know that this is no place for something less than perfect. Stars demand the best – and we do deliver the best. The complete custom cut foundation covering the bald area must be made out of the finest ultra fine, non – reflective Swiss lace which allows the scalp beneath the Hair System to breathe. If this is not the case then you are offered a copy or custom made wig, toupee or a fish net. Hair System does not damage your surrounding hair as you don’t need to weave them thrugh any “fish net” and you don’t need to expose them to any stress at all as that would damage them at the end. And the best of all is that the scalp under the System can breathe – so say goodbye to sweaty forehead and discomfort experienced by wearing wigs or so called “ hair systems “ with the base made of the silicon or any other plastic material which prevents breathing of skin under the replacement. Hair System is a high class product, developed and patented in Hollywood, LA, California. This is not hair transplantation and not a wig. Micro based foundation of a Swiss lace, which must match the tone of the skin, is custom made according to the markings, marking the bald area inside of the plaster mold of the client's head. These markings and design of the hairline must be done by the professionals as they know where to mark the start of the front line or the exact position of the sideburns. The hair is inserted into the foundation by the small tip curved needle with a microscopic fish hook cut into the end of the needle. The stitch is made and than a tiny knot is created using just 1 – 2 hair per knot. The knotting is done one hair at a time until the foundation has been completely filled with the correct amount of hair. The hair we use is only high quality Virgin European hair – that means it has have never been treated by chemicals or in any other way. Because of this we can proudly say that our hair is tangle free, has a luxurious texture and is resistant to fading, with color lasting up to 6 – 12 months. Hair is tested so it can not cause any type of allergies. Technology of crafting allows perfect fit and it has been developed in Hollywood on a demand from the movie industry. It allows breathing of the scalp beneath it and allows wearing for 24 hours a day; 7 days a week and up to 4 weeks without even taking it off. You can wash it on your head while taking shower or take it off and wash it. You can also change the adhesive tapes by yourselves – so there is no need to go to the club or retail salon. Clients wearing Hair System are the ones you don’t know that they have experienced hair loss. They look totally natural and they can pursue all kinds of sports they have enjoyed before – including surfing, scuba diving, swimming …. Hair System looks like a full head of your own hair as it really appears to be growing right out of your scalp. The patented specially tied knots enable you to create any hairstyle you want – including ones that allow you to comb your hair back and away from your face, exposing your entire front hairline, which is completely natural, undetectable to sight. This feature allows perfect fit of the Hair System. •	6 months worry free warranty. •	Individual styling (form, length, color of the hair). •	It stays on – until you decide to take it off. •	You can pursue all of your activities you liked before hair loss (including swimming, surfing, playing golf, riding your Harley or driving the convertible…). •	Enables breathing of the skin beneath the hair – which is mostly appreciated by the clients wearing wigs or toupees before. •	You can wear it 24 / 7 – and up to 4 weeks without even removing it (even when taking shower or while sleeping). •	It is ultra fine, light and most of all – undetectable. •	You can run your fingers through the Hair System as you would do it through your hair. And the best is that this can also do someone else – and no one will spot the difference between your new hair and your original hair. •	No more stress if someone will come close to the “protected area” or take a closer look at your face. 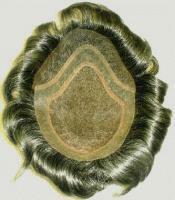 •	It is made of the very best European virgin hair available on the market. We never use synthetic hair, treated hair or hair from animals. The hair has never been treated before and it comes with natural colors lasting up to 6 – 12 months. After that period the stylist returns it in the original condition using special colors. •	You can comb your hair straight back or away from your face. •	It looks perfectly natural - and that is 24/7, giving your confidence back. •	Removing of the Hair System and fixation on the proper position is quite simple. •	You can remove it and clean it at the privacy of your own home as we offer you complete training on how to perform the regular cleaning including change of the adhesive tapes. The price of the training is already included in the price. •	Low maintenance costs – with offered service to add new hair when needed. •	It can last up to 4 years – and the price is from 800 EUR ( for partial Hair System ) only for optimal comfort, peace of mind and for a completely natural, healthy appearance. •	They can fall off the head by a quick movement of the head or body or even by a stronger blow of wind. Not to mention that you must be very careful while taking off caps or hats. •	It is not possible to wear them for a prolonged periods of time. •	The density of the hair is never natural – too dense in more than 80 %. •	It never looks 100 % natural as the hairline does not appear real and there is no graduation into normal density level. •	They are very uncomfortable – you don’t forget what you are wearing on your head – and you would be nervous every time a move in the direction of your hair is made which limits your self confidence and limit your performance. Both factors dramatically reduce your chance to get fair chance – to be a winner. 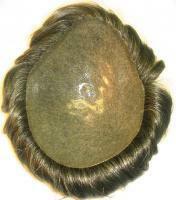 •	The b ase of the wigs and toupees is thick and it can irritate the skin. •	Most of them are factory produced. •	They are mostly done out of the chemically treated, dyed asian or indian hair, synthetic hair and sometimes even animal hair or combination of all of them. •	Limited hair styles options. •	Limited life span of the products – up to 1 year. •	To sum up - they do limit you at your professional, private and your sexual life.